On the occasion of the birth anniversary of Netaji Subhas Chandra Bose, hundreds of people under the banners of the Puri Ganatantra Jagaran Manch and Sarvodaya Mela Committee on Wednesday congregated at Netaji’s ancestral house at Gopalballav Road close to the sea beach here and held a meeting recalling the legendary leader’s role to make the country free from the British rule. In the morning, the activists came in a procession to the house where Netaji lived along with his father Janakinath Bose. At the meeting held there, noted academician Sudhakar Moahapatra was the chief guest. Bipinananda Mishra conducted the proceedings of the meeting. Others who spoke included advocate Sibaprasad Mishra, Jagannath Deo, Gobinda Mahapatra and Navinachandra Singh Samant. Speakers demanded that the Government acquire Netaji’s house at the earliest and convert it into a memorial. Another grand celebration of Netaji’s birthday was organised by the Makhanlala Haldar Memorial at the Subash Chandra Bose Square here with the district Collector addressing a large number of school students. Prizes were given to students who excelled in various fields. Jammu, Jan 23: Several social, political and other organizations of Jammu and Kashmir on Wednesday celebrated 116th Birth Anniversary of Netaji Subhash Chandra Bose. Jammu and Kashmir Freedom Fighters Association (JKFFA) held a function to pay rich tributes to Netaji Subhash Chandra Bose at Town Hall, Jammu. Various leaders and dignitaries also paid tributes on the statue of Netaji. The State President Jammu and Kashmir Indian Youth Congress (IYC) Mohammad Shahnawaz Choudhary was the chief guest and MLC Jahangir Mir was guest of honour who unfurled the National Flag along with the other senior leaders of the association on the occasion. The function was presided over by its president JKFFA, Ved Gandotra. Students of New Modern Higher Secondary School, Gummat also participated and presented patriotic cultural programme on the occasion. Those who were present on the occasion included NSUI President Udhay Bhanu, JMC Commissioner KL Khajuria, joint commissioner Babu Ram and Inder Minder Tar Singh. Jammu and Kashmir Netaji Subash Chander Bose Voluntary Association also (JKNSCBVA) paid rich tributes to Netaji in a function held at Mahesh Pura Chowk. The students of Shikha Bharati Public School, Maheshpura presented colourful and patriotic cultural programme for the audience on the occasion. The members of All India Forward Bloc (AIFB) also celebrated the birth anniversary of Netaji Subash Chander Bose by garlanding the statue of Netaji at Netaji Chowk Mahesh Pura. Party State Chief A K Kharu along with the General Secretary Rajan Padri and Vice-President Asif Geelani also garlanded the statue of Netaji. While speaking on the occasion, Kharu said that Netaji’s birthday should be declared as ‘Desh Prem Divas’ and Justice Mukherjee Commission report should be made public. He also informed that the Comrades of AIFB has celebrated Netaji’s birthday across the State by illumination and prayers. 23 January is Netaji Subhashchandra Bose’s birth anniversary. 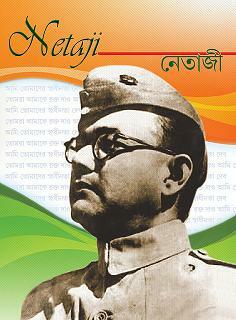 One of the real heroes of India’s freedom struggle, Netaji ran `India Government in Exile’. Raising 'Azad Hind Sena' *, he attacked British army from eastern borders. J P Singh salutes the hero. 23 Jan 1897 - ?? - ?? - ???? Popularly known as Netaji, Subhas Chandra Bose was one of the most popular, revered and fierce leader for a long time in the political scene of the world for spearheading India’s freedom struggle militarily. He founded a nationalist force called ‘Azad Hind Fauj’ (the Indian National Army). Twice he was elected as president of the Indian National Congress. He is acclaimed as a semi-God, akin to mythological heroes like Rama and Krishna and continues as a legend in Indian mind even today. Subhas Chandra was born on January 23 January 1897 in Cuttack as ninth child among the fourteen of Janakinath Bose, an advocate and Prabhavati Devi, a pious lady. A brilliant student, he topped the matriculation exam of Calcutta province and passed his BA in Philosophy from the Presidency College Calcutta. Influenced by Vivekananda's teachings, he was known for his patriotic zeal as a student. He was sent to England for the Indian Civil Service studies. Although he topped all those exams, but could not complete apprenticeship. Deeply disturbed by the Jallianwalla Bagh massacre, he returned to India. He came under the influence of Mahatma Gandhi and joined the Indian National Congress. Gandhi directed him to work with Deshbandhu Chittaranjan Das, whom Bose acknowledged as political guru. He was outspoken in his anti-British stance and was jailed eleven times between 1920 and 1941 for periods varying between six months and three years. Bose advocated complete freedom for India at the earliest, whereas the Congress wanted it in phases, through a Dominion status. Other younger leaders including Jawaharlal Nehru supported Bose and finally at the historic Lahore Convention, Congress adopted a resolution of `Poorna Swaraj’ as its motto. Inability of Congress leaders to save life of Shaheed Bhagat Singh infuriated Bose and he started a movement opposing the Gandhi-Irwin Peace Pact. He was imprisoned and expelled from India. Defying the ban, he returned and was imprisoned again. When the dangers of World War II were looming large, Bose warned British against dragging India into the war. Bose was elected president of the Indian National Congress in 1937 and in 1939. Second time he defeated Gandhi's nominee after which he brought a resolution to give the British six months to hand over India to the Indians, failing which, there would be a revolt. Since there was much opposition to his rigid stand, he resigned from presidentship in 1939 and formed a progressive group ‘Forward Block’. When World War II started, as predicted by Bose, India was declared as a warring state, without consulting Indian leaders. The Congress party was in power in seven states and all state govts resigned in protest. Bose started a mass movement against utilizing Indian men and material for the great war. To him, it made no sense to further bleed poor Indians for the sake of colonial and imperial nations. There was a tremendous response to his call and the British promptly imprisoned him. He took to indefinite hunger strike. As his health deteriorated on the 11th day of fasting, he was freed but was placed under house arrest. The British were afraid of violent reactions should something happen to him in prison. Suddenly Bose disappeared in 1941 and it was not until many days that authorities realized that he was not inside the house they were guarding. He traveled on foot, by car and train and resurfaced in Kabul, only to disappear once again. In November 1941, his radio broadcast from Germany sent shock waves among the British and electrified the Indian masses who realized that their leader was working on a master plan to free their motherland. It also gave fresh confidence to the revolutionaries in India who were challenging the British. The Axis powers assured Bose military and material help to fight the British. Thus the second phase of his saga began. Japan by that time had grown into another strong world power, having occupied key colonies of Dutch, French and British in Asia. Bose struck alliance with Germany and Japan. He felt that his presence in East Asia would help his countrymen in freedom struggle. It is told that he was last seen on land near Keil Canal in Germany, in early 1943. He undertook most hazardous journey under water in a German submarine, covering thousands of miles through enemy territories. He waded through the Atlantic, the Middle East, Madagascar and the Indian Ocean while the battles were being fought over land, in the air and the mines had been laid in the sea. At one stage he traveled 400 miles in a rubber dingy to reach a Japanese submarine to reach Tokyo. He was warmly received in Japan where he was to form a Provincial Indian Govt. On 4 July 1943, India’s would be George Washington, rose to accept leadership of Indian Freedom Movement in South East Asia. To the 2,000 reps of Indian Independence League in Singapore, he said that he could offer them nothing but hunger, thirst, privations, forced marches and death. “when we reach Red Fort and hold a victory parade there, no one can say who among us will be there, who among us will live to see India free. Whether we live or die, that is of no consequence, one thing that matters, the only truth is that India shall be free”. He was declared the head of 40,000 British Indian soldiers, taken prisoners by Japan. On 5th July 1943, after reviewing ceremonial parade of the soldiers, their supreme commander said that it had pleased Providence for him to announce to the whole world that ‘Indian National Army’ has come into being. He said, “George Washington could win freedom because he had his army; Garabaldi could liberate Italy with his armed volunteers. How many of us will survive this war, I do not know. But I do know that our task shall not end until our surviving heroes hold victory parade on another graveyard of British Empire, the Lal Qila of Delhi”. He announced formation of Indian National Army (INA) and gave them slogan of Chalo Delhi, reminiscent of 1857 rebellion. Subhas Brigade, Azad Brigade and Gandhi Brigade were raised, trained and prepared for liberating India. Slogan of Jai Hind has also been given to us by Netaji. He proclaimed formation of Provisional govt on 21 October 1943. INA freed the Andaman and Nicobar islands from the British which were renamed as Swaraj and Shaheed islands respectively. His govt started functioning from these islands. In January 1944 Provisional govt was moved to Rangoon. On 18 March 1944, with Chalo Delhi on their lips, INA soldiers crossed Indo- Burmese frontier to take the armed struggle to the Indian soil. INA marched through Burma and occupied Cox Town on the Indian Border. A touching scene ensued when the solders entered their 'freed' piece of motherland. Some lay down and kissed, some placed mud of mother earth on their foreheads while others wept. They were now inside India and were determined to drive out the British. Delhi Chalo was their war cry. The promised march however halted at Imphal. British were able to break the siege of Imphal after three and half tense months. They beat back the Japanese and INA’s march to Delhi. Military debacle at Imphal gave way to harrowing retreat into Burma. From Burma, Netaji with his surviving soldiers of INA retreated to Thailand. Atom bombs dropped at Hiroshima and Nagasaki in August 1945 brought the war to an abrupt end. On 15 August 1945, (two years prior to our independence) Netaji issued this last ‘order of the day’, “the roads to Delhi are many and Delhi still remains our goal. India shall be free and before long”. Somehow, the conquering hero, whose name was on every one’s lips did not make an appearance in Lal Qila on its climax. He was reported killed in air crash in Taipei on 18 August 1945 while on his way to Manchuria, presumably to negotiate honorable surrender of INA with the Russian help. The British imperialists had wanted him to be permanently dead whereas Indians had wished exactly the opposite and hence he continues to live in our minds. Capt (INA) Gandharb Singh, my revered father-in-law, served as Netaji’s Intelligence officer. He faced court martial and served a long jail term. He and his friend Sep (INA) Mr. Daniels would narrate me Netaji’s inspiring deeds, oratory, leadership, fearlessness and mysterious adventures. They were doubtful of Netaji’s death. His death or disappearance is still a mystery. I wish I had recorded their narrations. I regret it. With Capt Sahib’s passing away in 2002, that opportunity was lost. Netaji’s towering statue in Bakshinagar Rotary, facing East, reminds us that Indian well wishers are to the East. On 8 February 1946, the New York Times reported, “Indian nationalists are working day and night to build Bose as George Washington of India”. Admiration for Netaji was rampant in India despite his reported death, because of the court martial of prominent officers of INA at Red Fort which had transmitted the heroic story of INA and its leader to every Indian home. Whole country had been roused. Even regular army units were stirred. The man whom Bose was the first to hail as father of the nation now regarded his rebellious son as ‘prince among patriots’. 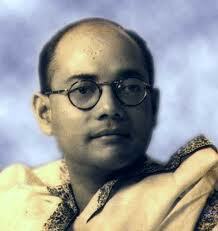 In South Indian subcontinent by contrast, Bose became a great popular hero, at par with Mahatma Gandhi. The Indian people were so much enamoured of ‘the famous Red Fort trial’, where INA Generals and Officers were tried. It became a landmark event. Initially, the British thought of a court-martial, but there was a countrywide protest against any kind of punishment to the members of INA. For common Indians, Axis and Allied powers hardly mattered, but they could not tolerate punishment of fellow countrymen who were fighting for freedom. British was in no position to face open rebellion or mutiny. A general amnesty for INA soldiers was declared. from all evils prevailing in the society. Cuttack: Chief minister, Naveen Patnaik today inagurated the spiritual gallery and switched on the light and sound systems at Netaji Museum built in Jankinath Bhawan, the birth place of Netaji Subhash Chandra Bose at Odia Bazar, Cuttack. Many important personalities, freedom fighters, school and college students have been lining up in the museum since morning to pay homage to the legend. The sand art and painting gallery has become the centre of attraction with people coming in flock from other cities to visit the museum. Nation observes Netaji Subhash Chandra Bose’s 116th birth anniversary today with various programmes. Netaji Subhas Chandra Bose in an Indian freedom fighter. Netaji Subhas Chandra Bose studied at Stewart School, Cuttack. Graduation: Netaji Subhas Chandra Bose persuaded his B.A. in philosophy in 1918 from Scottish Church College affiliated with University of Calcutta. Netaji Subhas Chandra Bose became general secretary of the Congress party in the year 1927. Netaji became the Mayor of Calcutta in 1930. Netaji originated All India Forward Bloc on January 22, 1939. On 4 July 1944, Bose's most famous quote was "Give me blood, and I shall give you freedom!" In this, he urged the people of India to join him in his fight against the British rulers. Azad Hind Fauj was founded on September 1, 1942. Indian National Army was organized by Netaji Subhas Chandra Bose. On August 18, 1945, it is to be believed that Netaji Subhas Chandra Bose was died in a plane crash at Taiwan while going to Tokyo and then the Soviet Union. Subhas Chandra Bose (23 January 1897 – unknown) also known as Netaji (Bengali/Oriya/Hindi): “Respected Leader”), was one of the most prominent Indian nationalist leaders who attempted to gain India's independence from British rule by force during the waning years of World War II with the help of the Axis powers. And each and every foolish act of his admirers, certainly Hindus, if not more, is fortifying confidence of filthy conspirators against Netaji Subhas for ages. It’s the time for us to crush the power exerting all pressures to retain this GREATEST UNTRUTH of his death. Not an iota of specimen has been found yet proclaiming death of Netaji Subhas loudly. Neither the three commissions (appointed by Central Government of India) to investigate death mystery of Netaji Subhash have deduced anything solid nor we Indians have found any hope from those. On the contrary, the government’s hesitations to deal with the reality and its overweening postures (at every time) have left all of us to smell a rat only. What is more, there is no end to hold over 1000 secret files about Netaji Subhas in an assortment of departments of Union Government of India. While the PMO (Prime Minister's Office) has 33 such files and 7 of those are labeled TOP SECRET. Ministry of Home Affairs holds 70,000 pages of secret information on Bose. The Ministry of External Affairs is holding at least 12 secret files. The Intelligence Bureau has 77 secret files. RA&W (Research and Analysis Wing) says it does not have any secret files about Bose but a sworn affidavit filed to one of the commissions reveals that it also possesses secret information. And the list goes on. When all these will come to the fore and TRUTH will be revealed remains unknown ………because struggle against demonism is not simple and there is a need of war altogether to have justice. If we Hindus can do the same, it must be started immediately as legal battles against the diabolical government is falling through and buying time only. Or if we prefer to exhibit our genetic impotency by shying from this task, we should stop celebrating birth anniversary of Netaji Subhas. We cowards are not fit to worship a Maha Kshatriya like him. It’s time to take the decision. Kolkata, Jan 23 : A Delhi-based NGO researching Netaji Subhas Chandra Bose's disappearance for over a decade,today urged the Centre for declassification of all documents and records concerning Netaji in national interest. "Our government does not want to release secret Netaji records for reasons of national security, but in nationalinterest all these should be declassified and it is the demand of most of Netaji's extended family members," Anuj Dhar, a key member of NGO, Mission Netaji told PTI here. Dhar, who has written 'Back from Dead: Inside the Subhas Bose Mystery' and 'India's Biggest Cover-up', saidthe US faced a similar situation over the controversysurrounding assassination of John F Kennedy. "The 30 years of government secrecy relating to theassassination led the Americans to believe that theirgovernment had something to hide ... Under the JFK Records Actof 1992, all records were made public and the controversy wasrested to the extent possible," Dhar said. Dhar said that time had come for India to take similarsteps to declassify all files and documents concerning Netaji in the face of 'crying public demand'. Gandhi british valltho fight chesadu. Gandhi asked Indians to support British in War. 2. Gandhi himself worked with British army when he is in South Africa, to occupy the tribal lands of zulus. 3. Unlike Gandhi who recruited Indians to fight for British in Boer war, Netaji never allowed his army to fight against Jews. to mind you, he himself a jewish wife. 4. He seek support from Hitler to free India. In war the principle is enemy's enemy is a friend. Share Share on facebookShare on linkedinShare on googleShare on emailmore. Netaji Subhas Chandra Bose's daughter Anita Pfaff on Sunday termed the Partition of the country and the resultant wars and arms race between India and Pakistan as a major disappointment, militating against her father's vision of the post-Independence nation. "far-sighted and visionary leader", she said Bose not only loved his country "fiercely", but was also pragmatic. "He had envisioned many far-sighted measures for the post-Independent period. Some came through even after his demise, even without his active role in planning of these ideas." "Again, there were other developments which deviated from what he had envisioned. I will name only three - the Partition of the country, and the slow progress in eradicating illiteracy and poverty," she said while addressing the inaugural session of Netaji's 116th birth anniversary at Netaji Bhavan in Kolkata. Later, Pfaff told media persons that the Partition of colonial India was the most disappointing development. "The deaths, lot of tragic consequences, the squandering of resources through unnecessary wars between the two nations that succeeded colonial India - it was the most disappointing development." The 70-year-old Pfaff said the money spent by the two countries on armament projects could have been better utilised in areas like healthcare and education. "All the money that was put into all sorts of projects - like armament projects, like procuring nuclear arms - had they been put into education, healthcare, that certainly would have been more beneficial to the population of India and Pakistan," she said. However, drawing a comparison between the two countries, she said India has had fewer problems because of the Partition, as it is a stable nation. In contrast, Pakistan is in severe problem. She praised the economic liberalization policies pursued in India in the 1990s, and said it provided a spectacular take-off for the economy. "Of course, it has a side product which I think you experience across the world. If you have higher growth, you always have inequality of income distribution, that unfortunately cannot be avoided." She said while the country has seen a decline in infant mortality, the failures on the birth control front have led to the rise of growing population among social groups which cannot afford education for their children. Pfaff lauded the way India has remained intact over the years despite its diversities. "In the early 1950s and 1960s there was a great concern that the country might drift apart due to the cultural differences that existed within. But India has managed remarkably well on containing the cultural odds". Pfaff also said she had no idea how the speculation that she would be bringing Netaji's ashes to India this month came out. A branch of Netaji's family as also many others outside believe that he died in a plane crash in Taiwan on Aug 18, 1945, and the ashes are preserved in the Renkoji temple in Tokyo. But there is also a strong second opinion across the nation which nixes the aircrash theory and does not consider the Renkoji ashes as those of Bose. "I don't have the ashes. It is not that I go over to the temple and say please hand them to me, as they are the remains of my father. It is not a private matter. Instead, it involves highly formal and diplomatic relations between two nations. The two nations need to agree on that," she said.